I haven't read a volume of short stories since, well, since about forever. I like getting engrossed in the plot and feel of a full-length novel. However, I picked up a copy of Zero Gravity while on an extended trip, and I read it immediately following a great but lengthy novel by Carol Berg. My flight was going to land in about an hour, so the short story format seemed appropriate to read one or two before landing, going through customs and immigration, getting a ride to the hotel, etc. I am glad I made that choice. One thing I really liked about the collection is that is was true scifi. I like fantasy, but I do miss the lack of science fiction coming out nowadays. As a kid, I was raised on scifi--now it seems to be fading in popularity, with fantasy, vampires, and the like taking over the shelf space. As with any collection of short stories, it can tend to be hit-or-miss, but with Zero Gravity, the hits outnumber the misses. And to further elevate the collection, they seem to go together well, to compliment each other. "Junker's Fancy," by Rosemary Jones, sets the tone of the collection with a well-written story about a woman who sails the solar system in search of junked ships. Jones does an excellent job of getting the feel of how it might be to cruise alone like that, worrying about making enough to stay in business. When she finds a nice abandoned ship, she knows she can get her finances back in the black, until she realizes that the ship is not quite abandoned. There is a survivor. Her emotions are very well described as she struggles to bring the ship back in time to save the survivor. This is quite a good story and proves that scifi does not have to revolve around technology, but rather the people in that environment. Other strong stories were "Leech Run," by Scott W. Baker, "Hawking's Caution," by Mark Rivett (in a sort of 1950's Golden Age of Scifi style), "Parhelion," by David Schembri, "The Unicorn Tree," by Alethea Kontis, "The Beacon of Hope," by Gregory L. Norris, "Tangwen's Last Heist," by C.B Calsing, and "The Stand-Ins," by Gef Fox. From adventure to examinations of morality, these stories hit the mark. They reflect on just what science fiction can be. I am not about to give up my novels, but his collection was a very nice break, and I enjoyed reading it. I intend on getting back to discover more collections of short stories, just as I did when I was a kid. 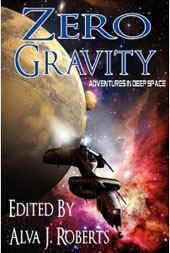 For more reviews or to buy Zero Gravity from Amazon.com, click here.